As part of our Banking Governance and Culture project, we have been able to test our new global standard for CEO remuneration. This MI standard provides for an executive remuneration system that is explicitly linked to Total Stakeholder Value (TSV); our value measure that combines a company’s shareholder returns with value created for all relevant societal stakeholders. Our chart shows that in the global banking sector, high pay for CEO’s is no guarantee that society will be served well by our banks. But nor does it mean that shareholders will either. 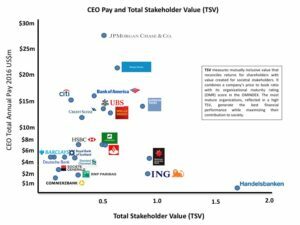 This work provides further evidence that executive pay systems remain broken and disconnected to the long term, sustained value that is being increasingly demanded, with only a small handful of organizations achieving the right kind of stakeholder outcomes. The good news is that we finally have an objective way of measuring executive pay against TSV that works as a coherent instrument for boards to apply in practice. We invite company boards, investors, regulators and other interested parties to adopt our universal instrument and begin the necessary fix to this long-standing problem. This entry was posted in Maturity Tales and tagged executive compensation, executive pay, executive reward. Bookmark the permalink.